Bob Stahl, PhD, has founded seven MBSR programs in the San Francisco Bay Area and currently directs three MBSR programs at Dominican Hospital, El Camino Hospital Mt. View and Los Gatos. 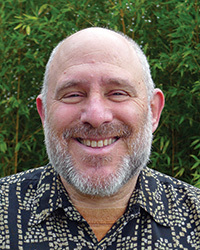 Bob serves as a Senior Teacher for Oasis, the institute for mindfulness-based professional education and innovation at the Center for Mindfulness in Medicine, Health Care and Society at the University of Massachusetts Medical School. He is a co-author ofA Mindfulness-Based Stress Reduction Workbook,Living With Your Heart Wide Open, Calming the Rush of Panic, and A Mindfulness-Based Stress Reduction Workbook for Anxiety. Bob formerly lived in a Theravada Buddhist forest monastery for 8.5 years and is now the Guiding teacher at Insight Santa Cruz and visiting teacher at Spirit Rock.